Fabric Mart Fabricistas: Made by a Fabricista: Deer and Doe Nenuphar Jacket + Burda 6849 tiny floral print shirt! 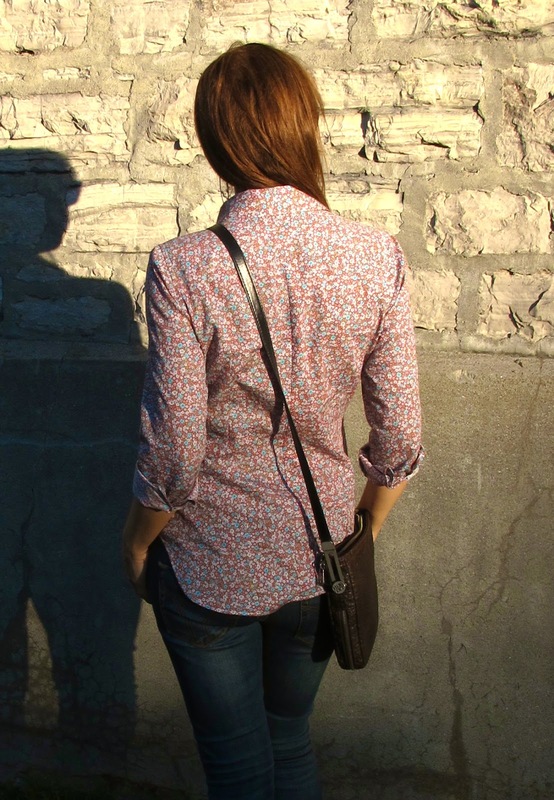 Made by a Fabricista: Deer and Doe Nenuphar Jacket + Burda 6849 tiny floral print shirt! Hi everybody, it's Virginie from Jazz Couture and I'm happy to share with you my 2 first fall makes! So for my first make I chose the Nenuphar pattern by Deer and Doe! 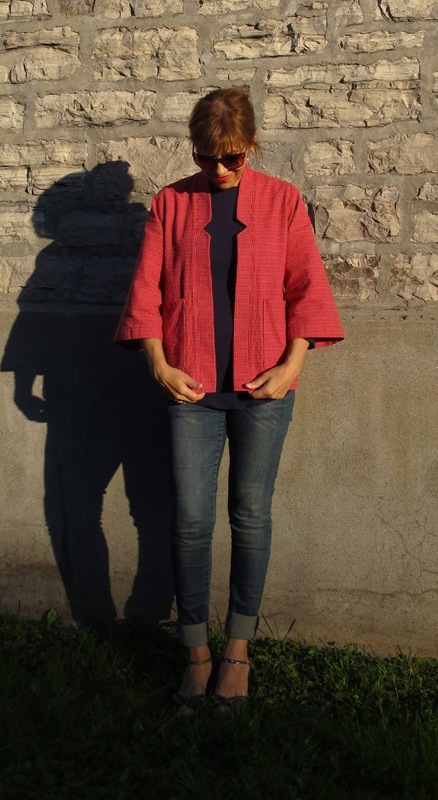 It is a light jacket that is perfect as a transitional, layering piece, and you could wear it with a jeans and t-shirt combo as I did, or over a straight dress or a pencil skirt. I made view A, which features 3/4 sleeves, front band and patch pockets with cutout details, and a two-piece back with a gathered bottom. If you are not familiar with Deer and Doe, it's a french pattern company and FM carry some of their most popular designs. The fabric I selected for my Nenuphar is a wonderful cotton/wool blend by designer Marc Jacobs. I must confess that I had a hard time deciding what to make with it, 'cause it's suitable for so many things: a dress, a skirt, shorts, jackets, etc. 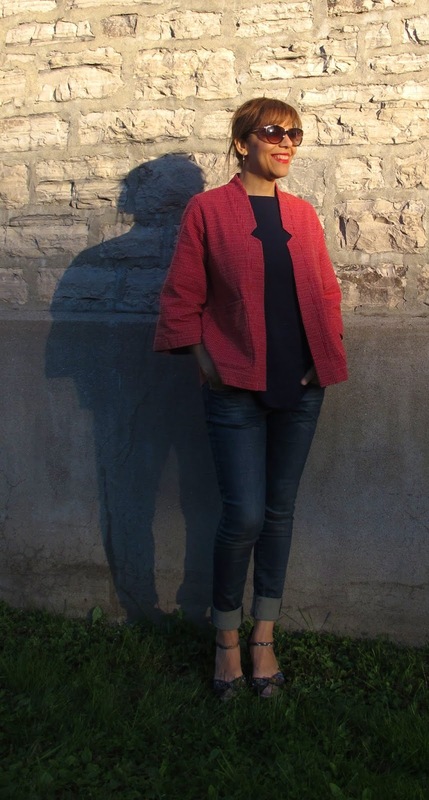 I don't remember how I stumbled on the Nenuphar jacket, but at the last minute I decided that this beautiful light suiting cotton would be perfect for that pattern, and I don't regret my choice! If you have this fabric, let me just mention that although the two sides might appear similar at first glance, they differ in that one side has an horizontal repeat (white lines) that is noticable if you step back a little bit, and the other side has no really noticable repeat. As the pattern does not lends itself well to stripes, I chose the side with no visible repeat. This Marc Jacobs fabric just sold out recently, but you could make this pattern with so many fabrics, let me just throw some ideas: any light suiting, chambray, light denim, 4 ply silk, silk taffeta, heavy linen, etc. 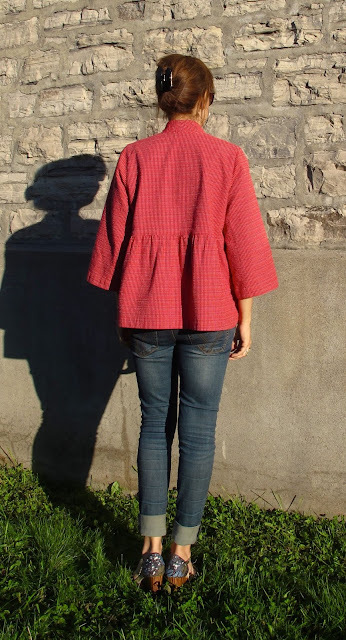 What I like about this pattern is that it's really versatile: make it with a fabric with some body and you get more of a jacket look, or pair it with silky prints and you get more of a kimono look! The Nenuphar hasn't been made that much here in North America, but it made quite a splash with the french sewists - there are wonderful versions of it on the internet! It was my first time using a Deer and Doe pattern and I'm happy to report that I'm positively impressed. 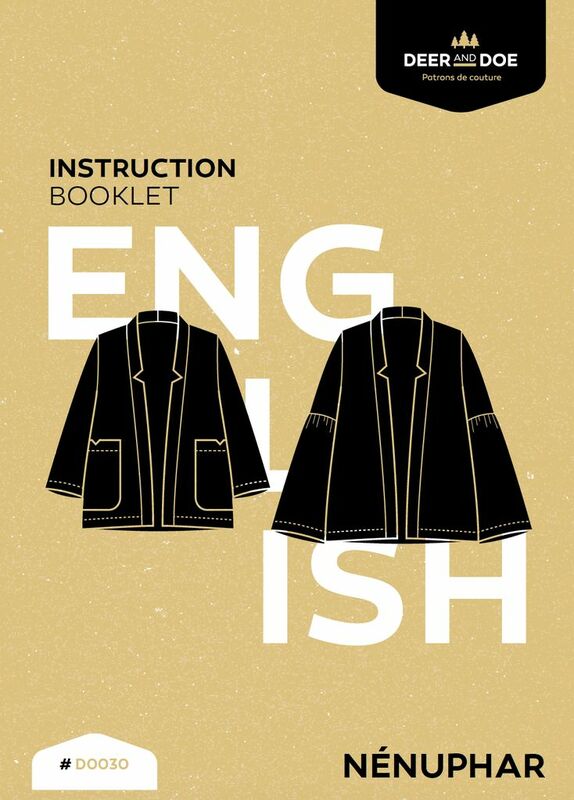 The Nenuphar jacket is a very well, thoughtfully drafted pattern: its proportions are just right! My measurements put me between size 36 and 38, but I chose to make a 36 since this jacket is not fitted anyway. The 36 was perfect for me, and I made no alterations other than removing 1/4'' at the inner back shoulder seam (tapering to nothing at the outer end) and giving it back to the inner front shoulder seam to rectify the angle that is too forward in my opinion. The sleeve head has almost no ease, which makes setting the sleeve in the armhole a breeze! I really like the high collar and the back on that jacket, it is short and the gathers give it a swingy look reminiscent of those trapeze coats of the 50's! I can definitely see other versions of the Nenuphar jacket in my future! 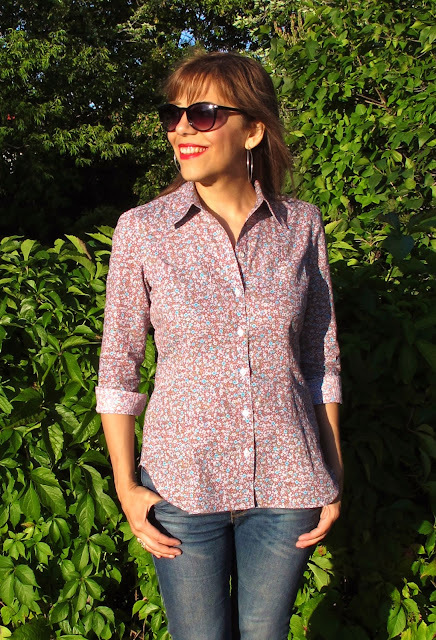 My second make is Burda 6849, a classic fitted shirt. I love making shirts 'cause it's precision sewing. This pattern is a TNT for me and I love everything about it - I made view B with the breast pockets (no pocket flaps) - the print is very busy so unfortunately the pockets and the seaming details did not get caught by my camera! This fabric really caught my eye when I saw it listed in the hawaiian designer category. It is a very delicate Liberty-esque tiny floral print (love love tiny floral prints), and I knew it really wanted to become a shirt! The colors are a mix of white, turquoise, yellow and apple green on an orangy red background - quite 70's in my opinion. The quality is awesome, and it's not exactly the same as the other hawaiian cotton lawns listed - it has more substance, and the wrong side has a jacquard like weave (see picture below). It is just beautiful, and perfect for a shirt (or a top, a dress, a skirt), and as we speak there are still a couple of yards available here! 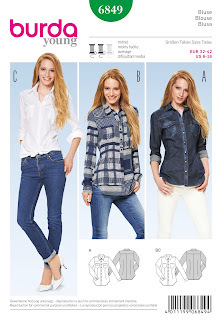 I love to wear a shirt at this time of year when temperatures are still warm but not like the scorching heat we had this summer, and a cute shirt with a pair of jeans looks casual and relax but never sloppy. I feel it's a real luxury to wear a custom made shirt when lots of RTW shirts are so ill fitting! I always feel a bit of melancholy when summer is over and gone are the sundresses days, but those 2 makes are a good kickstart for my fall sewing. I must focus now on transitional pieces, and as usual my head is spinning with so many ideas! What kind of sewing projects are you into at this time of year? It must be wonderful in chambray, and a linen version would be fantastic as well, I'm sure of that! It's a pattern that can be made up in so many different fabrics! Two beautiful and impeccably made garments! Thanks for pointing out the Nenuphar pattern- it's really unique and flattering. I bet that shirt will be a favorite for many years-it's a classic! Beautiful work, lovely fabric and pattern choices. Isn't it great when everything comes together AND for the upcoming season? I have a body that needs a little less precision though and so have been working on a fall/travel wardrobe made out of knits, many from a recent Fabric Mart purchase coincidently! I share your melancholy about the end of summer, but these are beautiful--they definitely lift my spirits! Is the jacket unlined? It looks very nice and like it would be fun to wear. Thank you! Yes, the jacket is unlined. That pattern is well drafted and that jacket is fun to make and fun to wear!